Offshore oil and gas production was conducted throughout the entire 20th century, but the industry's modern importance and vibrancy did not start until the early 1970s, when the North Sea became a major producer. Since then, the expansion of the offshore oil industry has been continuous and rapid. Pipelines, and more generally long tubular structures, are major oil and gas industry tools used in exploration, drilling, production, and transmission. Installing and operating tubular structures in deep waters places unique demands on them. Technical challenges within the field have spawned significant research and development efforts in a broad range of areas. 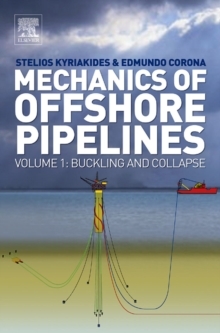 Volume I addresses problems of buckling and collapse of long inelastic cylinders under various loads encountered in the offshore arena. Several of the solutions are also directly applicable to land pipelines. The approach of Mechanics of Offshore Pipelines is problem oriented. The background of each problem and scenario are first outlined and each discussion finishes with design recommendations.